More than a dozen members of George Robinson’s family gathered in front of a white and light blue house in Washington Addition on Thursday afternoon. “You all are not at a press conference today. Today, we are at a crime scene,” Sweet said. Sweet announced that he and his father are representing Robinson’s family. They have hired an independent investigator to look into the death of the 62-year-old, who died of a head injury two days after he was arrested by Jackson police officers. “Upon our preliminary investigation, we believe that Mr. Robinson died as a result of police misconduct. We believe that Mr. Robinson died as a result of the use of excessive force by Jackson police officers,” Sweet said. Last week, the Jackson Police Department announced it launched an internal investigation into Robinson’s death. Hinds County Coroner Sharon Grisham-Stewart confirmed Wednesday Robinson’s death was ruled a homicide. That same day, Jackson Mayor Chokwe Antar Lumumba announced three officers involved with Robinson’s arrest have been placed on paid administrative leave. “(They) pulled him out of the car, and beat him — brutally beat him. And that beating resulted in his death. To add insult to injury, they gave him a citation for disobeying a police officer,” Sweet said. Police said those officers, who are part of JPD’s K-9 unit, were searching for the men suspected of killing the Rev. Anthony Longino as he opened his church, one block away from Robinson’s home, earlier that Sunday. Two men have since been charged with Longino’s murder. JPD is not releasing the officers’ names. Sweet also declined to identify them at this point. 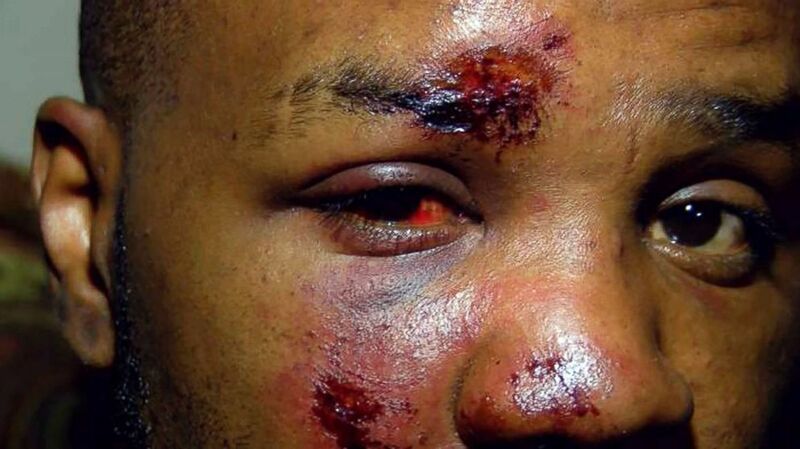 WAPT-TV reported witnesses saw police slam Robinson to the ground and hit him in the head with a flashlight. During last week’s press conference, Jackson Police Chief James Davis said it was too early in the investigation to confirm if that’s what happened. One friend called him a “source of happiness” in the neighborhood. The two Mississippi police officers could face additional charges. (Shakari Briggs/WDAM-TV, via AP) In this May 18, 2018 photograph taken from news video, James Barnett of Laurel, Miss., shows the injuries he allegedly sustained after two Laurel police officers pursued and arrested him after he turned around from a police checkpoint May 16. 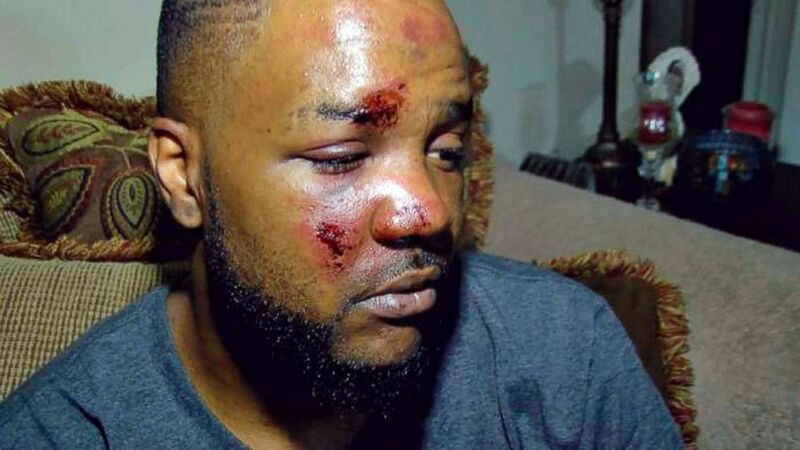 Two Mississippi police officers could be facing additional charges after they were terminated by the Laurel Police Department (LPD) for allegedly beating 36-year-old James Barnett last week. Barnett was pursued by officers after reaching a vehicle checkpoint and turning around in Jasper County. Following a short chase, Barnett was pulled over and the officers approached his car with their guns drawn, according to Barnett. Police told Barnett to get down on the ground and when he did, they began kicking him, Barnett said to ABC News. Barnett also claimed that he never fought back. (Shakari Briggs/WDAM-TV, via AP) In this May 18, 2018, photograph taken from news video, James Barnett of Laurel, Miss., shows the injuries he allegedly sustained after two Laurel police officers pursued and arrested him after he turned around from a police checkpoint May 16. The police then transported him to the South Central Regional Medical Center, where he was beaten more, Barnett claimed. The police charged him with five misdemeanors, including resisting arrest and driving with a suspended license. Barnett posted pictures of his alleged abuse on his Facebook page last week. “I’ve never been so afraid in my life,” Barnett wrote in the Facebook post. “I will not let this go, I don’t [want] this to happen to anyone else. There is no justice in what they did to me!! But I will get JUSTICE!! The supervisor on duty realized that there was a problem with the arrest that occurred, according to the Laurel Police Department. The department’s Internal Affairs (IA) began investigating hours after the incident occurred and the next day the officers, who were not named, were fired. The police department has been in contact with the Mississippi Bureau of Investigations (MBI) on the possibility of pressing additional charges against the involved officers. An expert on police ethics said Gulfport officers mishandled an unfounded burglary complaint from start to finish, leading to nationwide publicity over claims they drew guns on a family after pulling them over and responded inappropriately in a videotaped meeting with the family later that night. Pulling over Kelvin Fairley, who had left home with his wife and four children Sunday night, should have been handled differently, Michael W. Quinn said. Quinn is a police ethics trainer, consultant, author, lecturer and expert witness in cases of officers accused of criminal acts. Coincidentally, he taught an ethics class to Gulfport police supervisors a few years ago. “In a situation like this, the rush to put him and his wife in handcuffs and to use the language they used is not a reasonable expectation of any experienced officer,” Quinn said. Officers surrounded them after one of their neighbors reported a possible break-in and described the getaway vehicle. Police later learned Fairley lives at the house on Woodforest Drive and had just left home. Police pulled over the family in the parking lot of a closed business near Hancock Bank on Dedeaux Road. The caller had described a dark-colored SUV that drove away. It was the vehicle Fairley was driving when his family left their house. Quinn also expressed concern over how a police supervisor responded when Fairley and his wife, Natashia Krikorian, went to the police department to complain about what happened and to request copies of video footage from body cameras and patrol cars. Quinn viewed a video obtained by the Sun Herald on the supervisor’s response to the couple, which a relative videotaped. “The supervisor’s response was terrible,” Quinn said. The couple told the supervisor what happened and made it clear the family had been terrified. “Obviously, you don’t understand our business, OK?” said the officer, who identified himself as Sgt. Wilder. Quinn said the supervisor responded in an unreasonable and unprofessional manner. “It looks like they need a little help with communication skills,” he said. Gulfport Police Chief Leonard Papania has declined to speak to the media, but has said through a spokesman that allegations of officer misconduct are being investigated. Papania posted a 27-minute statement in a video posted on Facebook early Wednesday night. Fairley on Monday told the Sun Herald he went to the police department wanting to be heard and to get an apology. He has since met with an attorney. Fairley, who is black, said he believes he was racially profiled. Quinn said the situation could have been resolved quickly had the officers taken a more reasonable approach. “Asking for ID would have cleared up any questions,” Quinn said. A burglary is a property crime, not a crime of violence. The caller’s report of a possible burglary reportedly did not indicate the suspect was armed. Quinn said there are two better ways police could have responded. They could have secured Fairley in a patrol car and asked for his license. “A softer response would have been to ask ‘Where are you going?’ and ‘Where have you been?’ and ask for his driver’s license,” Quinn said. Quinn recently finished teaching a four-year ethics training program for the New Orleans Police Department. The training was mandated by the U.S. Justice Department in a consent decree. A judge ordered the training after a police coverup in which five officers were involved in fatal shootings of two men and the wounding of four others on the Danzinger Bridge shortly after Katrina. Quinn created the training program, called EPIC — Ethical Policing Is Courageous. Quinn wrote and published “Walking With the Devil: The Police Code of Silence,” in 2005. The book’s subtitle is “What bad cops don’t want you to know and good cops won’t tell you.” His third edition, “The Promise of Peer Intervention,” was published in 2016. Quinn has testified in federal court and given sworn expert opinions on the use of force, deadly force, police misconduct and accountability. Two Smith County Deputies have been fired after allegedly having inappropriate relationships with female inmates. The Federal Bureau of Investigations and the Smith County Sheriff’s Department is investigating allegations of two deputies have inappropriate relations with female inmates. Smith County Sheriff Charlie Crumpton received a call from the FBI on Thursday, May 18 and a meeting was set-up with them on May 19 to discuss the misconduct of the two deputies. Copies of all surveillance tapes and all records of inmates and the two deputies were provided to the FBI by Sheriff Crumpton and his staff. On Friday, May 19, after hearing of the allegations on Deputy Charles Johnson and Deputy Wayne Thompson, Sheriff Crumpton placed them on administrative leave pending further investigation. After nearly a week of further investigations by the FBI and the Sheriff’s Department, the two deputies were terminated by Sheriff Crumpton. Since it’s an ongoing criminal investigation by the FBI and an internal employee investigation ongoing by the Sheriff’s Department, Sheriff Crumpton states that this is all the information he can provide at this time. Sheriff Crumpton went on to say that it is not only his job to enforce the law, but also to protect those in his custody that have gone afoul of the law. Sheriff Crumpton stated that this comes at a bad time for such a small department to lose two men over these allegations, while at the same time of the upcoming retirement of long time Undersheriff Marty Patterson, who put in for his retirement two months ago to be effective at the end of June, after a total of 19 years with Smith County, and nearly 20 more years with Simpson County Sheriff’s Department and the State Tax Commission. Sheriff Crumpton stated that Undersheriff Patterson will return to work part-time after 90 days into retirement which is allowed under the State Retirement System. CLEVELAND, Miss. (WJTV) — A former City of Cleveland police officer was arrested on a grand larceny charge. Attorney General Jim Hood said 35-year-old Sandra Lomax was indicted on one count of grand larceny by the Bolivar County Grand Jury in March and arrested Wednesday, May 3. Lomax is accused of taking over $5,000 from a citizen while she was employed as a Cleveland, police officer. She was booked and released on a $10,000 bond. If convicted, Lomax faces up to 10 years in prison with a maximum fine of $10,000. PURVIS, Miss. – A Forrest County deputy is in custody for allegedly sending explicit content to a minor. WDAM-TV reports 45-year-old William Harold Brown Jr. surrendered to Purvis police Friday. Police Chief Joey Walker says Brown faces one felony count of computer luring of a person under 18 for sexual purposes. He is being held at the Lamar County Jail. Walker says the mother of the alleged victim, who is 13, came to the police department to make a statement regarding the case. He says the woman had her daughter’s phone which contained sexual photos and videos that were supposedly sent to her from Brown’s phone. Brown’s initial appearance is set for Monday where his bond will be set. Forrest County Sheriff Billy McGee was not immediately available for comment. A Jackson police officer has been relieved of his duties after a video was circulated in which it appeared he struck a handcuffed suspect with his knee. According to a release from Jackson Police Department, Officer Justin Roberts was terminated on Monday after the video surfaced Sunday. The release said that the actual incident occurred on Saturday. In the video, the suspect is blocked from view by another officer, but it appears that Roberts throws a knee at the man as they struggled. Upon receiving the video, Jackson Police Chief Lee Vance initiated an internal affairs investigation to see if any policies or procedures had been violated. The investigation was complete Monday, and revealed violations, the release stated, resulting in Roberts’ termination. JACKSON, Miss. (AP) – Officials expect a former Mississippi police officer to turn herself in on a manslaughter charge after her child died Friday when left for four hours in a patrol car. Hancock County Sheriff’s Investigator Glenn Grannan said Thursday that his department has issued the warrant for Cassie Barker. Grannan said Barker is expected to turn herself in Thursday afternoon, but isn’t expected to appear in court until later. Grannan said he doesn’t know the name of Barker’s lawyer. Barker’s 3-year-old daughter was found unresponsive in her Long Beach patrol car and pronounced dead at a hospital Friday. While officials have spelled the name of the girl as Cheyenn Hyer, her father spells it as Cheyenne Hyer. Officials quote Barker as saying she fell asleep while visiting another Long Beach officer, Sgt. Clark Ladner, at his house in Kiln. Barker left Hyer strapped in a child seat in the running patrol car. Barker was hospitalized after the child’s death, with officials saying she was in shock. However, Hancock County Sheriff Ricky Adam told the Sun Herald she has since been released. “If she doesn’t turn herself in today, I plan to charge anybody that is helping her,” Adam told the newspaper Thursday morning. Grannan said Wednesday that investigators have learned that Barker left her daughter alone in a car at least once before, in nearby Gulfport in April 2015. Police responded and child welfare officials took temporary custody of the girl at the time. Barker and Ladner were both fired Tuesday by the Long Beach Board of Aldermen for violating department policies. Bass said that officials don’t now plan to charge Ladner, who has told officials he didn’t know the girl was in the car. The Sun Herald reported he had taken a sleep aid and also fell asleep. Hancock County Coroner Jim Faulk said Wednesday that the state crime lab in Pearl has yet to complete an autopsy or determine what caused Hyer’s death. Officials suspect she died of overexposure to heat. JACKSON, Miss. (AP) – A Jackson police officer has been fired after being indicted on a federal bribery charge. The U.S. attorney’s office says officer Melvin Williams was arrested Thursday. He appeared before a federal magistrate, pleaded not guilty and was released on $10,000 bond. Jackson Police Chief Lee Vance told multiple news outlets that Williams, who had been an officer six years, was fired after being arrested. According to a news release from the U.S. attorney, the indictment charges that from February until this month, Williams solicited, demanded and accepted things of value totaling $5,000 from a person intending to be influenced and rewarded. The person is not identified. Williams is scheduled for trial Dec. 5.